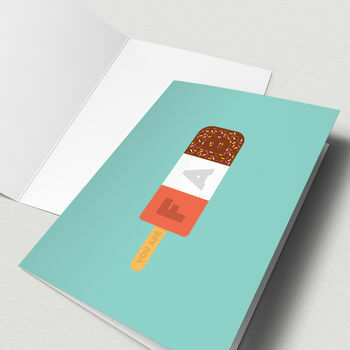 This illustrated ice lolly greetings card is perfect for that fabulous individual in your life! This card is printed on a smooth white 300gsm card stock. It is supplied with a premium white envelope and is sealed inside a clear cellophane bag to keep it in tip top condition until you are ready to use it. We post our cards in a rigid envelope mailer to ensure safe delivery. If required, you can choose to have your card purchase sent direct to your recipient. This is perfect if you are in a hurry or if you want to save on the hassle of posting the card yourself. If you choose to send direct, your chosen message will be neatly written by hand exactly as typed and will be sent to the delivery address provided. A receipts will not be sent to the recipient. Our cards are printed on paper sourced from well managed forests. The Forest Stewardship Council (FSC) is a not-for-profit organisation established to promote the responsible management of the world's forests. Our paper is FSC-certified. This product is dispatched to you by The Good Mood Society.